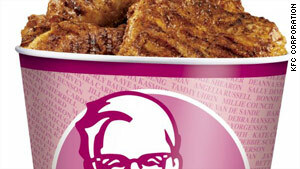 KFC will donate 50 cents from each pink bucket sale to organizations funding cancer research. (CNN) -- Can chicken breasts help beat breast cancer? KFC officials are hoping customers will flock to help the chicken chain make a record-breaking donation of $8.5 million. But some critics are calling foul on the company's mixed message, especially in light of the recent, heavily publicized addition of the aggressively fat-and-sodium laden Double Down sandwich to their menu. KFC's "Buckets for the Cure" initiative boasts a bright pink website, packed with breast cancer facts, survivor stories and a pledge to donate 50 cents from each specially branded pink bucket of their grilled or Original Recipe chicken to Susan G. Komen for the Cure. The Komen organization funds research grants and community-based outreach projects focused on breast health education, screening and treatment. The KFC site's stated goal is to make the largest single donation in history toward Komen's efforts with combined individual and KFC corporate contributions during the campaign that runs until May 5. Sounds like something to crow about, right? Not according to New York University professor Marion Nestle, who maintains the Food Politics website. "OK, scientists are still arguing about the dietary determinants of breast cancer and aren't too worried about fat, but they do worry about body weight," the professor of nutrition, food studies and public health posted on her blog. "Maintaining a healthy body weight is still the first recommendation of the American Cancer Society, for example." The Food and Fitness section of ACS's website warns, "Being overweight or obese increases the risk of several cancers, including cancers of the breast (among women past menopause)..."
Nestle tells CNN, "The goals of food companies, alas, are not the same as the goals of public health. Food companies are businesses that must sell expanding numbers of products. While it seems possible that their goals and those of public health could overlap, they rarely do. Buckets for the Cure gets money for whatever it does. KFC sells more buckets. Sounds good, if you don't think about it too much." However, KFC officials tell CNN that they're sensitive to conscientious customers. KFC's Rick Maynard said, "We have something for everyone, including people who are counting calories for health reasons." "Last year, we introduced Kentucky Grilled Chicken, which has fewer calories, fewer fat grams and less sodium that our Original Recipe chicken. Kentucky Grilled Chicken is the product that is featured in our commercial for 'Buckets for the Cure,' and we are seeing lots of customers ask for pink buckets filled with KGC." It is the bucket color that is troubling Barbara Brenner, executive director of Breast Cancer Action, an organization that calls itself a watchdog group seeking to compel the changes to end breast cancer. She tells CNN that her group believes the KFC campaign is based in "pinkwashing" -- putting a pink, cancer-awareness ribbon on products that are bad for health. Her beef isn't just with the chicken chain, though; it's with the Komen Foundation. "This will keep them (Komen) in business for years. They talk about a cure, but this this partnership will create more breast cancer. And Komen knows this," said Brenner on the assumed relationship between fast food, excess weight and cancer risk. Brenner went on to say, "Komen puts the responsibility for health in individuals' hands, but some people don't have the option to take care of themselves. Say you don't have the money or choice -- KFC is making money in the poorest communities." Komen's director of communication, Andrea Rader, tells CNN the claims are "ludicrous." "These partnerships go a long way toward supporting education and direct care for over 1,900 communities across the country. These programs provide mammograms to women in low-income communities," Rader said. "And people are still operating under old and crazy myths -- people ask us if they can get cancer from wearing a underwire bra. There is not enough awareness out there," she says. As to Brenner's claims, Rader says, "It's insane to say that we're exploiting poor people, and there's a logical flaw in that argument. Healthier choices are available on the menu. Are they saying that poorer people won't make them?" Rader added the Komen Foundation seeks to add $20 million in funding for cancer prevention research this year, atop the $50 million they've previously invested. "Buckets for the Cure" website states, albeit at the very bottom, that individual consumer purchases will not directly increase the total donation -- rather that the money is determined by purchases of buckets by KFC restaurant operators. Despite the controversy, it seems franchisees have been flocking to help out. The campaign has thus far raised more than $2 million dollars.